What Are Squirrel Monkeys And How Do You Recognize Them? The Squirrel monkeys are considered to be new world monkeys; and they have short fur all around them. The fur at their shoulders is olive colored and its back is yellow-orange shades. The squirrel monkeys ears and throat are completely white but the mouth of the monkeys is completely black. Their heads are going to be quite hairy and their faces have a black and white shading around them. They can be called a ‘death’s head monkey’ because of the shades of color to the head. Some of the monkeys can grow from around 20 to 40 centimeters but this can vary from male and females and the age of the monkey also. Though, the males are going to weigh anything from 750 grams to 1100 grams; and the females weigh only 500 to around 700-750 grams. The squirrel monkey tails are bi colored and have a black tip; but their lips and nostrils are mostly hairless. However, the lower legs are longer than the thighs which help to offer them a better jumping force. The Central American squirrel monkeys are smaller than most and will be slender also. Their tails are long and their fur is a yellow-brown color with the belly being yellow also. Usually the squirrel monkeys can be found in Central America usually in Costa Rica and panama. These monkeys love the tropical rain forests and areas which has tropical deciduous forests and cultivated areas also. They love areas which have rivers and streams running along them and do try to set up home near these areas. Secondary and primary forests are some of the best locations to find the squirrely monkeys. They love these areas and can be occasionally found in the canopy leaves and sometimes on the ground also. 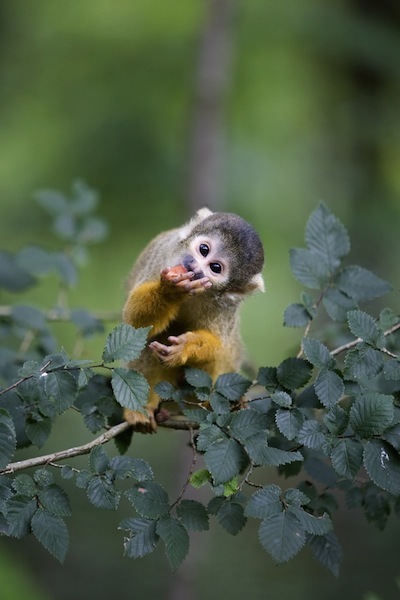 Most squirrely monkeys are arboreal and cannot use their tails to climb. Most other new world monkeys are able to use their tails to climb. They will use their tails as a tool to balance rather than climbing but it can work as a tool at times also. They move very quickly from tree to tree. They will be able to live within large groups of both female and male monkeys; and the groups will be able to split into small groups if necessary. They do have vocal calls which can include warnings and threatening behavior to deter falcons and other predators to them. Most of the squirrel monkeys love to consume these types of foods especially the fruits. Though they can eat seeds and leaves also; but for only one hour of the day, the monkeys go out hunting for food. The rest of the day, if they find spiders or insects, they will consume them. How do squirrel monkeys reproduce? There are many things which can influence when the squirrel monkeys will mate. For most of the times, it will be the seasons that determine when the monkeys will mate. Though, most females will give birth during the seasons which are more rainy; and the female mothers are going to care for the young exclusively! Most of the young will be weaned for 4 months however some subspecies are weaned when they are 18 months old. Most females squirrels are going to reach sexual maturity when they are three years old; but the males take until the age of five before they reach maturity. Though, the monkeys are only going to live to around the age of 15 but this is in the wild; in captivity, the animals live for around 20 years. Though the time in which the monkeys can live, can vary though; the monkeys do actually get the menopause and this usually happens during the mid teens of the life span of the monkeys. There isn’t a lot known about the mating ritual of the squirrel monkey; for many groups of the squirrel monkeys, they will breed within their own groups. They usually reside in larger mixed groups; and the males of the group will start to reproduce during the mating season exclusively. All of the males compete with one another in order to win the affections of the female who will go into heat so that they can mate. This can cause a lot of problems; fights can break out between members of the group and cause serious injuries. Though, the females are not going to discriminate from one male to another. Many females will mate with those whom she likes and there are occasions when females mate with multiple males during the mating season. Most monkeys will breed seasonally however, and usually the mating season will range from September through to November. Some subspecies can only mate in a 12-36 hour window if they wish to produce infants. Though, when the births occur, it will be when the rain is heavy and there is more food available. Most of the times, it will be between the months of February through to April. The female squirrel monkeys are able to reach maturity when they are around 2, 2 and a half years old; males take longer time to mature. Most infants are only going to weigh around 100 grams and will cling to the mother’s body during the first few weeks of life. The infants will be feed by their mother’s milk for a good period of time, mostly six months; however the infants can grow quickly. 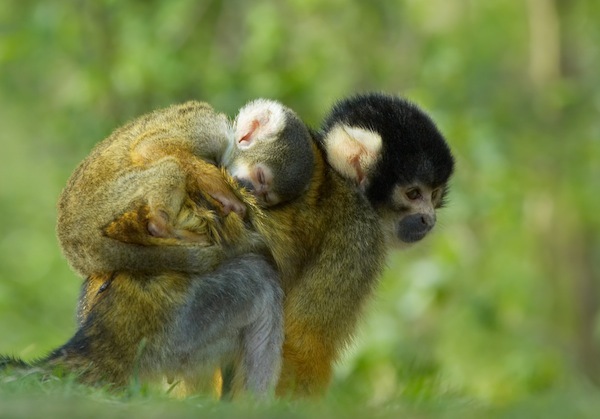 Most of the squirrel monkeys grow quickly and this leads the female to be able to have another child a year later. Usually most of the male squirrels are not going to have any say or involvement in raising the infants.